Writing Azure automation scripts to schedule on/off times for non-production VMs can be a counter-productive way to optimize Microsoft cloud computing costs. In some circumstances, it could cost more to write Azure automation scripts for non-production VMs than an organization will actually save. Certainly it is more reliable than having developers switch non-production VMs on/off manually at the beginning and end of every workday, but reassigning development teams from core activities to write scripts for automating Azure VMs is not only an expensive use of resources, it can also delay the completion of other projects. A more practical and cost-effective solution is to use off-the-shelf scripts for automating Azure VMs. This is definitely one scenario when buying is better than building, as off-the-shelf scripts for automating Azure VMs enable organizations to optimize the cost of deploying development, testing and staging VMs on Microsoft Azure with just a few clicks of a mouse. In addition to saving the cost of writing Azure automation scripts for non-production VMs – potentially across multiple regions and pricing options – off-the-shelf scripts for automating Azure VMs help organizations with the governance of their Microsoft accounts. Using the VM scheduling software, administrators can access a single view of all an organization´s accounts to create permission tiers and roles. Once a structure of permission tiers and roles has been established, development teams can schedule on/off times for their own development, testing and staging VMs without impacting other teams´ schedules. Teams can be held accountable for their own development costs to help control project budgets and optimize Microsoft cloud computing costs. The VM scheduling software in the off-the-shelf package is a Software-as-a-Service app that users log into using their Microsoft Azure credentials. Once logged in, the app locates the Azure VMs assigned to the development team and makes recommendations about which non-production VMs can be scheduled based on their names and tags. Team members have the choice of assigning one schedule to all of their non-production VMs, or scheduling VMs/groups of VMs individually. There is also the choice of selecting a pre-configured schedule of on/off times (for example on during weekdays from 8:00am to 6:00pm) or creating a new schedule via the intuitive interface. Once each of the schedules has been confirmed, the UI displays a figure representing the projected savings over the next thirty days. As soon as the schedules are running, a second figure appears displaying the actual savings. The schedules can be changed whenever necessary, or “snoozed” if team members require access to the VMs while they are switched off. The most important consideration when evaluating the benefits of VM scheduling software is “How much will I save?” The savings will depend on the number of non-production VMs an organization deploys on Microsoft Azure, the pricing tiers to which they are assigned, their size, and the on/off scheduling times assigned to them. Based on the pre-configured schedule suggested above (on during weekdays from 8:00am to 6:00pm), an organization would save more than 70% on the cost of deploying non-production VMs on Microsoft Azure – and that does not take into account the productivity savings of not having to reassign a development team to write scripts for automating Azure VMs. If you are aware of the number of non-production compute resources your organization uses, and your compute spend as a percentage of your overall cloud spend, you can work out how much your organization could save by taking advantage of ParkMyCloud´s VM scheduling software on our Cloud Cost Savings Calculator. Alternatively, you are invited to try ParkMyCloud free for thirty days. If your organization wants to optimize Microsoft cloud computing costs in the most effective way possible, we invite you to try ParkMyCloud free for thirty days. Our invitation provides your organization with the opportunity to experience our alternative to Azure automation scripts in your own environment with no commitment to continue using our service at the end of the trial period. To find out more about this opportunity, do not hesitate to contact us today. Our team of friendly Customer Service Representatives will be happy to answer any questions you have and guide you through the registration process for our free trial. We are confident that once you have scheduled your first non-production VMs with a few clicks of a mouse, you will agree ParkMyCloud is a more cost-effective alternative to writing scripts for automating Azure VMs. Reassigning developers to write Azure automation scripts can cost you more than you will save. ParkMyCloud´s scheduling software is easy to use and could reduce Azure costs by up to 70%. Our scheduling software also gives you the tools required to enforce accountability. 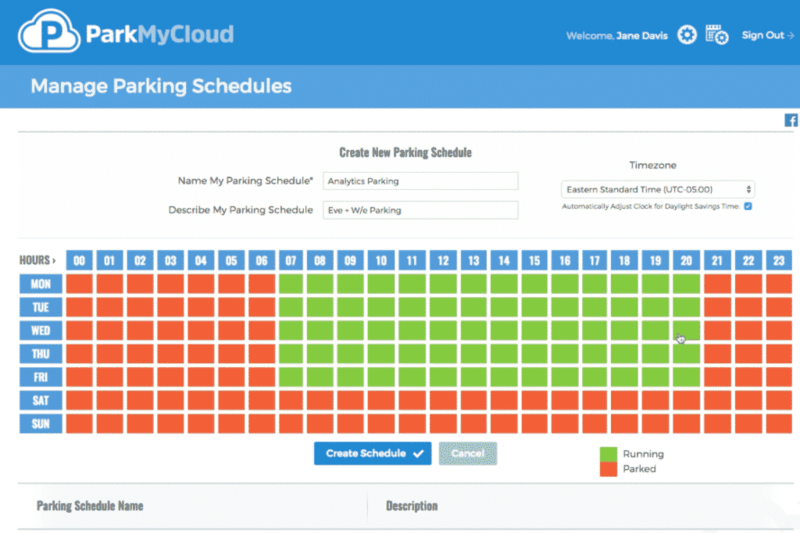 Take a free trial of ParkMyCloud today and get total visibility over your accounts.